The Walking Dead‘s L.A.-based spin-off has its return date: Sunday, April 10 at 9/8c. 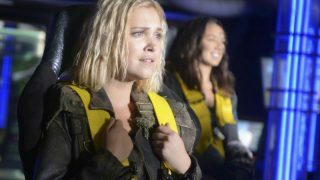 Fear the Walking Dead returns for its second season after a short but well-received run of six episodes last summer. The story left off with Travis’s group having escaped from the quarantine zone in Los Angeles, looking to head out to sea on board Mr. Strand’s yacht. AMC plans to split the 15-episode season into two blocks, with seven episodes airing in the spring and the other eight picking up later in 2016. That means the show will pick up after the sixth season finale of The Walking Dead, and then most likely take a break for part of the summer before returning ahead of the flagship show’s October premiere. Chris Hardwick’s recap talker Talking Dead will expand this year and air after every episode of Fear the Walking Dead, as well as the parent show. 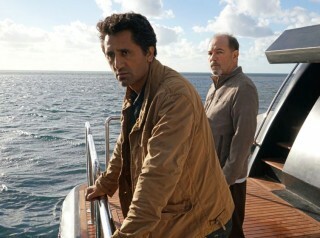 The network also released the first image from Season Two (above), showing Travis (Cliff Curtis) and Daniel (Rubén Blades) on a boat evidently at sea. But don’t expect them to spend the whole season out there — after all, this is a show about encounters with the undead. Fear will be up against HBO’s Game of Thrones when it returns for its sixth season just two weeks later. But that’s what DVRs are for, right?